The U16 international youth basketball tournament in Poinçonnet, France will tip-off on Saturday, 3 April with a match between Belgium and Spain and will end on Monday, 5 April with France taking on Spain. 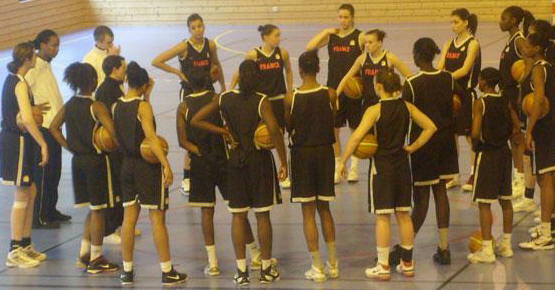 Valériane Ayayi, Marième Badiane, Imane Brahmi, Lisa Cloarec, Olivia Epoupa, Aby Gaye, Assitan Kone, Axelle Koundouno, Céline Pfister, Awa Sissoko, Mamignan Toure, Lidija Turcinovic. Heleen Adams, Josephine Anseeuw, Hind Ben Abdelkader, Axelle Bernard, Saar Bogaert, Antonia Delaere, Jolien Goyvaerts, Malon Humblet, Camille Lebrun, An-Katrien Nauwelaers, Janne Roggemans, Jille Van Meerbeeck, Nette Van Oeckel. Julia Adamowicz, Elzbieta Giedrojc, Daria Marciniak, Malwina Rudzka, Maja Rynkiewicz, Monika Skrzecz, Paula Swiatowska, Anita Trzeclak. Spain have two members from the U16 2009 European Champions in their roster of 14 players. Jose I. Hernández who coached the squad to the championship title last season is the new coach for the senior team. So Anna Junyer and Betty Cebrián are the new coaches for this season. The players are: Elena de Alfredo, Rocío Torcal, Leticia Romero, Gala Mestres, Laura Marín, Marta Pérez, Deborah González, Marta Montoliu, Laura Aliaga, Belén Arrojo, Marles Balart, Ana Carlota Faussurier, Laura Correa, Patricia Soler.